Available in powers from -8.00D to +6.00D, Freshlook contact lenses come in six striking colours including: Sapphire Blue, Misty Grey, green, violet, hazel, and blue. Whether you want to make a subtle or dramatic change to your eye colour, Freshlook contact lenses will give you the desired results. They are opaque and completely cover and obscure the iris, changing the eye colour instantly. Although they can dramatically alter your eye colour, the look is anything but fake. It’s all thanks to the way in which these coloured contact lenses have been manufactured. They attract and reflect light for a natural look. 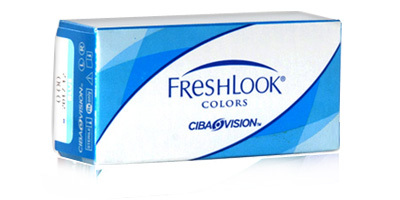 Also known as Freshlook Colours, these monthly disposable lenses provide clear vision for those with younger eyes and can be worn by those with very slight astigmatism, subject to optician approval. 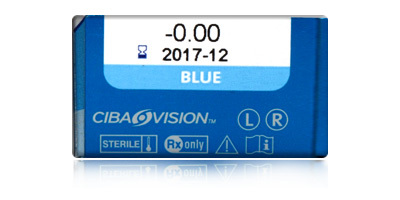 Ciba Vision have a reputation for producing sophisticated contact lenses that supply consistent, sharp vision. 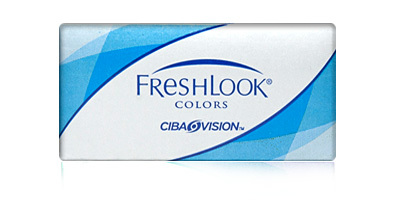 Freshlook lenses aren’t just about fashion; they perform equally well on the function front. Eye health hasn’t been overlooked, quite the opposite in fact. A higher than usual water content coupled with a super soft and smooth material make Freshlook contact lenses naturally moisture-rich and highly breathable. Eyes stay consistently bright, clear and hydrated. Freshlook contact lenses can also be worn by those with 20/20 vision for cosmetic reasons. If you want sapphire blue eyes for the night, just choose the power 0.00 and the option “no prescription”, pop them in and wow friends and family with your stunning eyes. Need advice on choosing and wearing coloured contact lenses? Call the ContactLensesExpress team on 0800 037 4000. We strive to ship all orders the same day and have a 98% success rate. I ordered to be delivered to my office in thailand, the delivery was fast and secured, about 10 working days. I am also happy with the price, the cheapest i found. Also i have been buying cibavision misty grey power -8.00 for years but now hard to find this strong prescrition. Very happy to have found your website which carries this product. Please dont discontinue it! Thanks.